Here we are! That illusive book review that has taken me so long to write up. I was approached by Bernadette Noll and Kathie Sever, the authors of “Make Something Together” a few months ago, before their book was released. They asked if I would like to be part of their book blog tour and although I have never said yes to a giveaway on Filth Wizardry before, and I was just about to give birth, I wanted to say yes to this particular book. The way they described it to me, it sounded quite lovely and totally in keeping with the vibe of our home, so I wanted to be involved in helping to promote it in some way. Now that things have reached some sort of rhythm in the newborn department and I’ve had a chance to really sit down and read through the book and see how the projects and philosophy are applicable to our own family, I’m ready and able to write about it and of course offer a copy of the book to one lucky commenter on this post. Bernadette and Kathie, the authors of this book, have had a lot of experience with collaborative crafting, especially with children. Bernadette co-founded Slow Family Living and Kathie is the creator of Ramonsterwear. Together they have formed Future Craft Collective to find ways that families can be creative together in a sustainable fashion. At the start of the book, before you get to the detail of the individual projects, they take the time to share their experiences and talk about the “why” and “what to expect” aspects of creating with your family. This part of the book, as well as being very well written is also extremely encouraging to those that are nervous about setting the right environment for a pleasant crafting experience when children are involved. I think the thing that I like most about this book is that it is relevant to a large range of ages and abilities. Out of the 24 projects, some are simple projects that younger children can use as an initiation into sewing and to gain confidence quickly, but there are also more complicated projects that preteens will be able to throw themselves into. As much as I can see me and my five and six year old making some of these things together, I can equally imagine that the book is still going to be in use when my older girls are ten and eleven and they have their little five year old sister to help join in with the making too. The other thing that stood out to me when I read through this book was that the projects are all real keepers. You're upcycling, reusing and recycling materials, but in a way that creates family items that will really become part of the home atmosphere and traditions. Most of the upcycling that I do with the kids when we craft is making things that are fun and yes they use recycled materials most of the time, but they aren't things that I can see us having and still using say ten years from now. 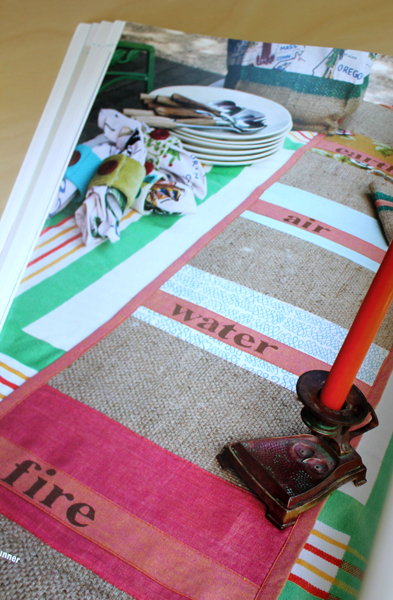 In contrast to our usual fun with recycling, I'm excited to make some items from this book, such as the table runner and napkins or the family flags, that can be more permanent creative fixtures in our family's home for years to come. I've wanted to sit down at the sewing machine with my older girls, who are five and six years old for some time now, but deciding on what we should try and how to go about it has delayed me taking the plunge. I think it's this book that's going to ease us into the process of sewing together and I'm looking forward to it! If you'd like a chance to win your own copy of "Making Stuff Together" then just leave a comment on this post and I'll announce a winner on Wednesday next week. Wow. This looks like a great book! My 6 year old son would love to make that last bag. I have an old singer not in use which he's asked me to use a few times. I also have a new baby and we moved cross country so my crafting mojo has been kaput. I'd love to win a copy of this book! My girlies are 6, 4.5, 2 and -1 week, so I can see using it for a loooong time. Thanks for the chance to win! What a fun book! My 10'yr old daughter and I love to create together. What an interesting book! It sounds right up my alley. This book looks really great! Thanks for the opportunity to win a copy of it! Those projects sound great! I'd love to see what my son and I could make together. This looks like a good exception to the rule! i'm brand new to your blog...and i've LOVED exploring your posts. so much creative goodness up in here!! I'm doing my best to raise some crafty girls, we'd love some new ideas! thanks for the giveaway! 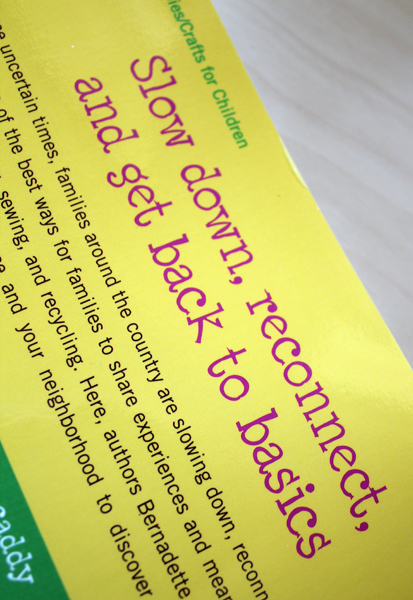 I'm a home-schoolin' mama and this book looks like it would be great for ideas with my little ones. i'm always looking for things to make with my kids so this would be fun to get my hands on. I would love to enter to win the book, thanks. This looks like a great book! My daughter and I would love to make some of these projects together. 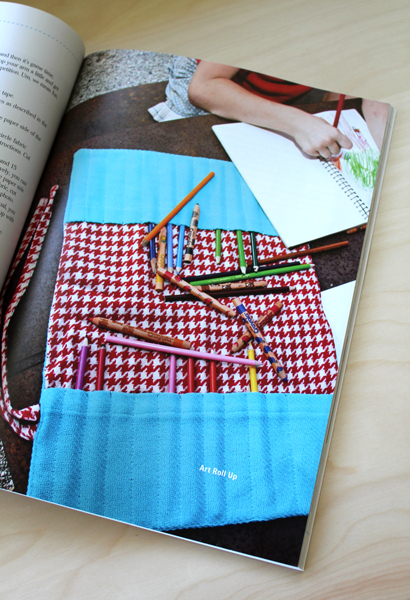 What a great creative collaborative craft book to have at home! Thanks! I would love to make projects from this book with my 3 kids! This sounds like a really fab book. Would love to work some of these projects with my 6yo crafter-extraordinaire. Thi sbook looks very excellent. This looks like the perfect book for my kids. My eldest two (7 and 5) have wanted to learn how to sew for so long, but it is hard to come up with easy projects for them. This might just be it! My little one can then also join in in time. . . thanks for the opportunity! We'd love to give this book a look-see. Wow!!! Super book!!! My son is 1 year old. I'm reading your blog for a last few month - you are great MOM!!! Thank you for your blog!! What a great book to give away—I am a grandma now with elementary school-age grandkids and a Brother sewing machine that loves to thread its own needle. Thanks for the chance. OOoooo! We have so much material and craft stuff in the loft that dh is now referring to it as 'loft insulation'. He has issued an ultimatum: me and the kids must use up craft material soon or it'll be so hot in the house we'll be down to our undies. (Don't suppose HE'd mind but I need to lose at least a stone before THAT happens lol). Looks awesome! Pick me, pick me, pick me! Please? I'm not crafty or handy, but I have been trying to figure out how to sew with my two daughters (8 and 4). This book looks wonderful! Looks like a fun book. It's nice to see you back! wow, that looks like an awesome book. even if i don't win it, it is going on our wish list. thanks for the review! Wow, it certainly looks like an amazing book. Can't wait to get my hands on it. this sounds awesome! I'd love this book! This sounds like something my kids and I would really get into. My little one is ready to take on the sewing machine, he hovers over me everytime I sit down to mend something. Looks fun! It's always great to find new ways to engage the kids. Thanks for the book review. I love your blog! I've been following it for over a year now, and I always enjoy seeing the creative things that you and your girls do. I have been watching your blog for a year now (and your hubby's too) and I must say I am impressed. I have 3 sisters, one is 10 the other is 14 and we love playing around with craft every friday afternoon. There are a few of your projects we have even indulged in. I am a budding illustrator with a passion for childlike art, my mum sews and my dad is a blinky-flashy diy christmas light guy. Your blog has inspired us all. We would totally use this book.Love the examples. Lola and I would love this book. We have just moved and our craft room is still a mess, but that will soon be taken care of. Looks like a good one, thanks for the review! Stuff to make that isn't just more 'stuff'? Heck yes, please! Yes please! I would love some more ideas to get crafting with my almost three year old daughter! Looks like a great book! I've been trying to figure out how to get my six year started on the sewing machine and this may be just what we need! My son is only 5, but he is already showing signs of being a maker. Everything he see he asks, "can I recycle this?" which means he wants to use it to create one of his junk robots. I'd love to get him into fabrics as well. this would be an incredible win! Four kiddos, one on the way... We'll definitely get some use out of this book! If you find the ideas in the book to hold promise, it must be worth a peek! My 5 and 7 year old are just getting into sewing and I have been looking for simple new projects! Just started sewing with my daughter, and this looks fantastic! I Lovve the idea of this book - my just-turned-4-year old daughter started school this morning so that's put a bit of a halt on our summer of crafting fun. We're definitely ready to move up to the next level! Looks like a super book! Thanks for the review, too! My 8 year old is always up for new projects! My son was asking me to make him a "spy belt" just today. The bag in that last photo looks like it would work perfectly. This looks like a cool book and I would love to win it. Sounds like a great book - my daughter is just getting to the age where collaborative projects are possible! looks like a fun book! and who doesn't need some extra inspiration from time to time? Would love to win a copy ^_^. I read your blog all the time to see what creative things you guys are up to. Your crafting with your girls has inspired some of the things I've done w/ my two (age 4 1/2 and 2 1/2). If you say it's a good book I'm definitely adding it to my wishlist lol. Would love to enjoy this book! Please! 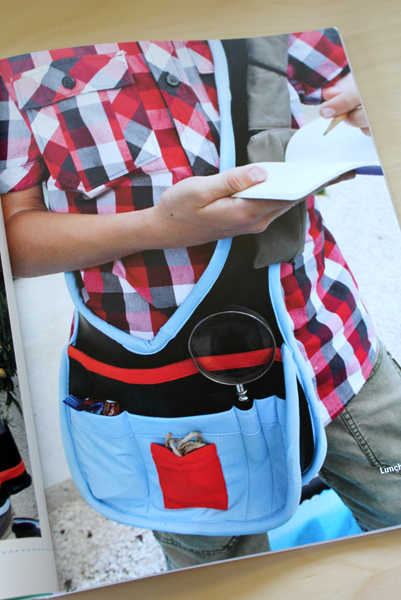 My son is 5 and I've been wondering about how to get him into sewing - this would be fab! Wonderful! I have a special new mom I would love to give this two. She just had her second child and is wondering how she is going to manage both and still have time to play and create. Wow... sounds like such a fun book.... I'll have to check it out - I am always looking for fun ideas for my kiddos! I'm only a new reader to your blog and I'm enjoying it so far! With a 15 month old, we are just branching out into the world of art and craft and it is a bit daunting. I'm giving it my best shot so far, and a book like this would be a big help! Sounds like a wonderful book, I'm sure my 2 boys and I would love the projects. Thanks for the giveaway! OH, OH, OH! My girls and I would LOVE this book. What a neat-looking book. It's fun to craft with my kids, but I need direction. First of all, congratulations on your new little blessing. Thank you for talking about this book. It looks amazing! This book would be a great tool in our house! What a fabulous book! Looks like tons of fun! Looks like so much fun! As a mom and arts teacher, I could really appreciate a book like this! THANKS! My 3.5 year old twins tell everyone proudly that "Mama can make anything." They are so very wrong about that, as evidenced by the dragon whose pipe-cleaner-wrapped-with-embroidery-thread hand popped off yesterday. But I'd like to live up to their ideals, and this book would sure help. So fun! My boys love projects like the ones you've described. The photographs look amazing! So envious to whoever scores this book. Thanks so much for deciding to do this giveaway. This book looks great! The book looks like a lot of fun! I would love to win it for my kids! Yes! This looks fun. I'm always wanting new ideas to make with the young 'ens. What a nice book! I'd love a copy to enjoy with my little girl. This looks SOO great! We'd LOVE this book! 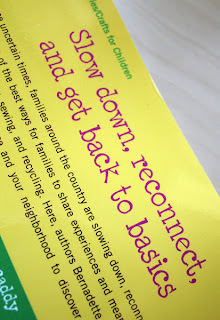 We do need to slow down and reconnect...This would help. Looks like a book that I need in our craft area! Looks like an amazing book! My daughter loves to make things! Looks great!!! Thanks for the chance! coolness! this looks like great, can't wait to see it in hand! Ooh, that last bag pictured looks awesome! We'll have to get the book for that pattern alone. I would with developmentally delayed adults, we are always looking for new projects, this book would be awesome. This looks like a brilliant book! I'd love to use it with my 5 year-old son. I don't know if your giveaway is open to people overseas (I live in Australia) but if so, I'd love to be included with a chance. My twins boys just turned 5 and we love to do stuff together. I like having some quality time with them when I am not taking care of the younger two boys! Oh wow this book looks amazing!!! I love creating fun things for my little boys - I make fun and adventurous table tents out of upcycled materials - they're great for when it's raining outside but I need so patterns for making fun things for the kids to play with when they're outside. I LOVE the explorer belt my boys would LOVE that!!! Thanks for hosting this giveaway! I'd love a chance to get some craft momentum as my kids (3 and almost 1) get old enough to enjoy it. This book would be a wonderful addition to what my children and I already work on together. This would definitely give our crafting time some much needed "strength". This book seems full of great ideas, I'm sure its an asset to every mum and teacher. I'd love to have it! I love making any kind of "stuff" with my kiddo. Sewing is something I haven't tried yet....a new idea is always appreciated. "Make Stuff Together" looks so great but I would take any recommendation from you blindly! I have tried so many projects of yours. Thank you. Can't wait to get my hands on this book. Hopefully winning it but looks like a purchase if not! Great review. oh, I've been awaiting your next post. Your blog inspired me to make one too. please also consider me for the comp. oh! I'd love to try for it. I would love that book for me and my little girl! This sounds like a fantastic book. I have recently learned to sew and I love it. My boys (ages 12 and 8) are interested in it as well, but I have been tentative to have them help me. My 3 year old loves seeing the results of my projects. 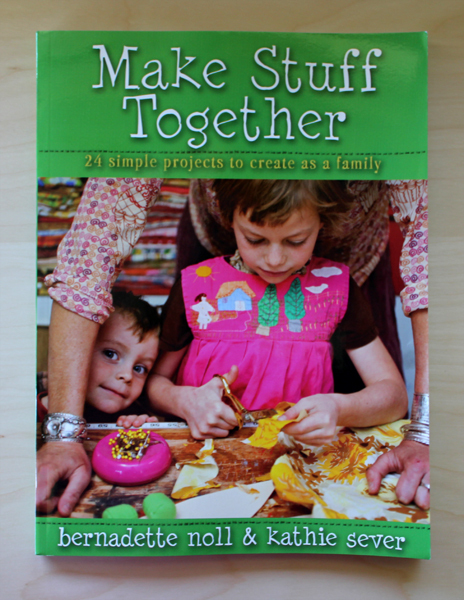 This book might be the perfect thing for us to get started in crafting as a family. This is the kind of book that should have been around when I was a child. It might have helped my craft-loving mum impart her love of craft to her kids that bit more easily. We've since bridged that gap a lot, and I'd love to buy this book so our 3 generations can craft up a storm! I love your review. Making things with my kids is fun, but I am a practical sort of person and the idea of making things that will be useful for years to come sounds perfect. I'm in! Hope you've had a great summer, thanks for the book review. Looks neat! This is an awesome book! I have a friend that loves working with handcrafts and with kids with special needs, so I'm sure she will love it! This books looks fantastic - would love to win:) Just found your blog - wonderful stuff! That looks like an awesome book! I'm really trying to do more and more crafting with the kids....it's hard sometimes with a toddler. Can be do daunting! I would love to win this book! My boys are going to love making stuff with me! Congratulations on your new healthy baby girl! Looks like an awesome book! Thanks for your great craft ideas and passing along the idea of others as well! Looks like an awesome book, thanks for sharing! I am totally going to have to get one. This looks like a fantastic book to help me through the school year with my 3yo who thinks she should be in school like her big sisters. Would definitely keep her busy. I teach VERY low budget art classes to Montessori kids in our public school system, this book looks like a great source for inventive ideas! I love crafting with my kiddo's. I am making that bag/tool pouch this weekend. This book looks splendid. Thanks again for Filth Wizardry. I would love to win a copy of this book but based on your comments, if I don't win one I will definetly buy a copy. I like the idea of having a book that will span s few years. Wow, the projects look like so much fun! I would love to have this book at home! Wow! What a beautiful and thoughtful review! thank you so so much. Don't count me in the count for winners but do count me as a fan of yours!!! Awesome giveaway! I've just recently discovered their website and would love a copy of their new book. I would love to win this book, thank you for the chance! With 5 kiddos in the home it's sure to get plenty of use here! My 2 year old boy is totally getting into dress-ups right now and would love to have a copy of this book to delve into sewing projects and get ideas for creating some fun stuff with him. I'd love to have a copy to share with my friends and all of our kiddos. This looks like an excellent book! I love this website!!! You always put out great crafts and info and I love great craft ideas that are easy to do with my son. This book looks like a winner for me! I can't wait to try these activitie with my granddaughters! I'd love to win a copy of the book, even with sticky, Jammy-dodger prints! Wow, sounds like a great book, thanks for the giveaway! My son and I would enjoy going through it together. My granddaughter got a sewing machine a couple of years ago but we've never done much with it. Would love to try some of these projects. If I don't win this book I'm definitely ordering it! This book looks like it would be jam packed with great ideas!!!! Love your site!!!! I so appreciate this review. What a fantastic sounding book - so many learning moments, so much to share, so much to create. I cannot purchase this book right now, so would be over the moon if I won it in this giveaway! Thank you! Not sure if my post went through. I really love your blog and my 4 year old twins love making your crafting ideas with me! We have made light sabers, baby wipes flowers, stain glass on our front windows, and many others! Thank you for all your great ideas! What a lovely looking book. I have a three and three quarters year old son (that fraction is very important to him) and a very almost one year old daughter and like you whilst we really enjoy making things together I've sad at how impermanent most of it is. I'd love some inspiration to make more lasting upcycled projects. I also need to say a huge thank you for the swords tutorial you gave alphamom a million years ago (which is how I discovered you) my son and his friends have a whole armoury now with shields made from cardboard with rolled newspaper grips. We made a recent trip to Lewes Castle in East Sussex and I think the custodians thought the Norman invasion had returned! I'd love to win this book. My children are 9, 6, 5,and 4. They love to craft...and I'd love some more permanently useful crafts. Love what I see here! Thank you for such a great opportunity! How lucky the winner to get this book is! Thank you again! This looks like a great book. I love being crafty and with a 2 year old granddaughter and 2 more on the way, it would be a nice addition to my library of craft books. Oh my gosh, that last bag is AWESOME! My kids 4 and 5 would love this book. Can't wait! Very fun! I would be thrilled to win a copy of this book. I would love this book! What a great concept! ooooh. Yes please! Looks incredible. We're always after ideas of what to do with 'stuff' that I don't like throwing away. I make assemblage sculptures from found objects and my kids are always wanting to make them too! My two 6 year olds and 2 almost 5 year olds would love the activities in this book! Such wonderful things for children to explore! If you like it, it sure must be great! I would love to win! so great! your blog has been wonderful inspiration. This sounds like a great book. Thanks in advance! this sounds like a great book for our library! I've recommended your site to a few friends with small children. We are always interested in seeing what comes next, with great pictures too. My little two year old daughter loves making things and we'd love to have a look at this treasure trove of ideas. this book looks fantastic, although I am not sure if this giveaway extends to South Africa???? I hope it does. My daughter is 18 months and loves doing and creating and messing almost as much as I do. It is great that we are starting to do it together. i love your blog too- you have super ideas and projects that i have tried with my 5 1/2 year old daughter... i love your casual- anyone can 'just' DO IT vibe..i have JUSt taken out my sewing machine with her for the first time and she is super duper keen to try it again ....i agree-- this book looks like it would be fun! i'll look for it if i don't win one :o) thanks! I would be very happy to win the book. Making stuff is what we do! Thank you for sharing your creativity, or home is more vibrant because of you! Sounds lovely! I would be very happy to receive a copy of this book. I would love to win this book! Thanks for such a great blog! This looks like a brilliant book, with 3 little go makers in the house things like this never go astray!